POSTED January 24, 2019 11:54 a.m. Junior Sami Martin caught the pass, turned over her left shoulder and scored over a pair of defenders just 23 seconds into Thursday’s Southwest Wisconsin Conference girls basketball game against visiting Lancaster. It was a move she has made hundreds of times, but this particular basket was extra special. 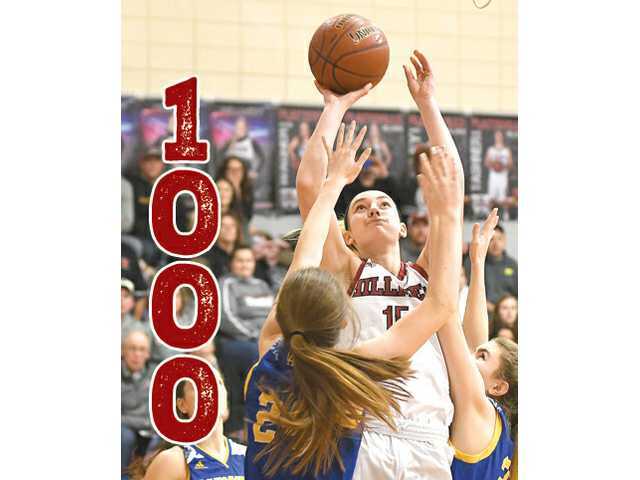 This one gave Martin an even 1,000 points for her career, as the Division 1 recruit became just the third player in the history of the program to reach the milestone mark, and the ninth athlete in school history to do so. She is this week’s Mast Water Technology SWNews4U.com Athlete of the Week. The game was stopped momentarily as Hillmen fans celebrated with 1,000 signs throughout the crowd and Martin was congratulated by teammates, coach Mike Foley, and even ran to the top of the bleachers to hug her parents. Martin joined 1993 PHS grad Nikki Taggart (1,381 points), who played collegiately at Purdue and later Marquette, and 2001 grad Kimberly Becker, who played at UW–Milwaukee, as the only Platteville girls to reach 1,000 points. Six Platteville boys have accomplished the feat, including Donovan Blevins just last year. But there was plenty more work to be done. Martin went on to score a game-high 27 points, including the go-ahead three-point play 41.2 seconds left, and grabbed 16 rebounds to help the Hillmen escape with a 61–60 victory that kept their conference title hopes alive. “It is a great individual mark for Sami,” said Foley. “It is also great for the Platteville girls’ basketball program and also great for this team. Sami has worked hard to reach the level she is at. It was fitting that Sami scored the opening two points and she also stepped up and had an important 3 point play at the end on the game. Butler scored 12 of her game-high 20 points in the second half to lead the top-ranked Warriors to a 60–42 over #2 Melrose–Mindoro (13–1) last Saturday at JustAGame Fieldhouse in Wisconsin Dells. She also had seven rebounds, three assists and two steals. Butler matched her career-high with 24 points, while dishing out seven assists and snatching eight steals in the Warriors’ 85–22 victory over Pecatonica last Tuesday. Johnson scored 11 of her game-high 17 points in the second half to lead Mineral Point to a key 61–47 SWAL victory at Darlington last Thursday night in a battle of first place teams. The Pointers (12–3, 7–1 SWAL) remained in a first-place tie with Cuba City (11–3, 7–1), while the Redbirds (11–3, 6–2) slipped to third place. Schaefer (3–0) went 3–0, with a bye, a 59-second pin and an 8–0 major decision over Beloit Memorial’s Tyler Sireci to win the 195-pound title at last Saturday’s Monroe Invitational. He was named the Most Outstanding Wrestler of the tournament and helped the Braves finish third. Schaefer also scored a second-period pin in the Braves’ 48–24 victory over Dodgeville last Thursday night, Belmont/Platteville’s first SWC dual meet victory in seven years.